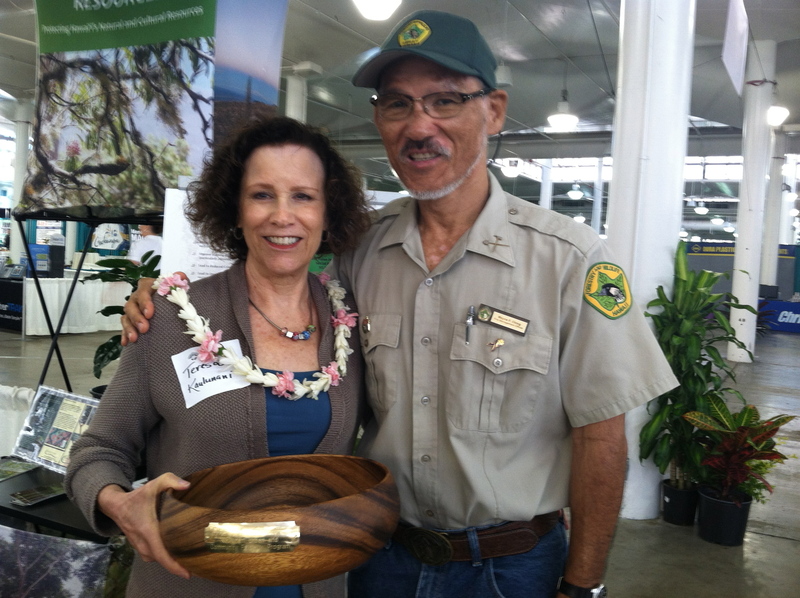 Teresa Trueman-Madriaga, Kaulunani manager (left) accepts the LICH award, with Wayne Ching (right), DLNR protection forester. HONOLULU — The Kaulunani Urban and Community Forestry Program was recently awarded the PlantPono/Invasive Plants Advocacy Award from the Landscape Industry Council of Hawaii for having the vision to support the Hawaii-Pacific Weed Risk Assessment, which has transitioned from being a UH research project to one of the Hawai‘i Invasive Species Council’s key prevention projects. The Hawaii-Pacific Weed Risk Assessment was developed to help identify plants that pose a high weed risk in Hawaii and on other Pacific islands and is widely used and recognized as one of the primary measurement systems predicting invasive plant probability across all ecosystems in Hawaii. In 2001, Kaulunani hosted a gathering of urban foresters, botanists, conservationists and educators to discuss the relationship between invasive species in urban areas and wild land areas. This collaborative working group recommended an integrated course of action to reduce the negative impacts of invasive species on the native ecosystems. By the time this urban forestry project was completed in 2004, more than 600 plants had been analyzed and given a weed risk score. To date, 1,486 plant species have been screened using the Weed Risk Assessment. The Weed Risk Assessment continues to have an ever-increasing significance for the health of forests in urban and conservation lands. A subsequent tool, the Plant Pono website, was created as a companion education and outreach component. Together they make this valuable information available to an audience that also includes landscapers, homeowners and developers. Kaulunani’s leadership and funding helped create the foundation for this primary information source used today to protect our urban, conservation and coastal lands from invasive plant introductions. “Both the conservation community and the landscape industry are the two communities most likely impacted by the continued use and widespread adoption of the weed risk assessment and the desire to ‘Plant Pono,’ ” said Charles Chimera, a Weed Risk Assessment specialist with the Hawaii Invasive Species Council. “If we can prevent the introduction of the next Miconia, the next fireweed, or the next fountain grass, potentially every community in the islands would benefit—whether you value native ecosystems, are a farmer or rancher trying to make a living, or are a resident living in an area prone to fire,“ Chimera said. Conservation leaders and land managers are a natural audience for use of the Weed Risk Assessment and Plant Pono website. Hawaii Landscape Industry Council members are also key adopters of the system. Of the 378 assessment requests received from January 2012 to October 2013, 15 percent were from private individuals, 47 percent were from industry-related groups (landscape, nursery, botanical gardens, etc. ), and the remaining 38 percent were from conservation groups or government agencies who use this in planning their land management strategies. The Plant Pono website is currently adding components that will allow easier access and dialogue for homeowners and gardeners.